Storefront availability allows you to set how you want your product displayed after it is sold. You can set your SureDone Storefront to display or act in multiple ways. You have three main options. You may also set your product display for your entire site and all new listings will be set. Always Available - always display – Your product will always display, and will let someone purchase it even though your stock count is 0 in SureDone. Inventory Controlled - always display - Your product will always display, but read out of stock on the Storefront when stock is 0 in SureDone. The combinations below correspond to the choices above. Again, this will set the display rule for all of your items. There is also an option that affects availability in search results. 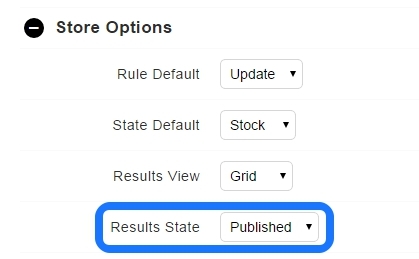 You will see a drop-down for Results State. Choose Available and when a customer does a search, it will pull up what’s in stock. Choose Published and when a customer does a search, it will pull up any product that is still live on the site with or without stock.